It is sometimes desirable to take a dispense or issue that has been booked against one job and re-allocate part of it against a different job, for instance if there is material left in a press sump that you want to allocate to the next job to run. There are two different options to split a Dispense or Issue. Will only allow splitting to jobs that have the formulation that was in the dispense or issue. Will allow booking to any job even if it does not contain the dispensed formulation. You click the Add button to add the jobs and screens that you wish to split the dispense between. Manual – User enters how much should go in each job. 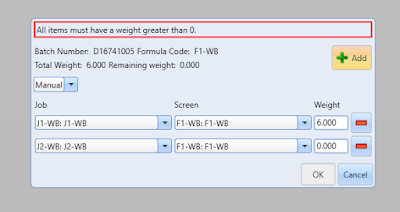 Estimated – Set the weight for each job to the remaining estimated for that job. Weighted Estimate – Allocate the dispense between selected jobs proportionally based on the estimated requirements for each job. to remove a job from the dialog.